Geoffrey Johns (born January 25, 1973) is an American comic book writer, screenwriter and film and television producer. He served as the President and Chief Creative Officer (CCO) of DC Entertainment from 2016 to 2018, after his initial appointment as CCO in 2010. Some of his most notable work has used the DC Comics characters Green Lantern, Aquaman, Flash, and Superman. In 2018, he stepped down from his executive role at DC Entertainment to open a production company, Mad Ghost Productions, to focus on writing and producing film, television and comic book titles based on DC properties. Some of his work in television includes the series Blade, Smallville, Arrow and The Flash. He was a co-producer on the film Green Lantern (2011) and a producer on Justice League (2017). He co-wrote the story for Aquaman (2018) and the screenplay for Wonder Woman 1984 (2020). 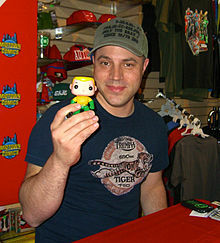 Geoff Johns was born January 25, 1973, in Detroit, Michigan, the son of Barbara and Fred Johns. He is of half Lebanese ancestry, and grew up in the suburbs of Grosse Pointe and Clarkston. As a child, Johns and his brother first discovered comics through an old box of comics they found in their grandmother's attic, which included copies of The Flash, Superman, Green Lantern, and Batman from the 1960s and 1970s. Johns eventually began to patronize a comics shop in Traverse City, recalling that the first new comics he bought were Crisis on Infinite Earths #3 or 4 and The Flash #348 or 349, as the latter was his favorite character. As Johns continued collecting comics, he gravitated toward DC Comics and later Vertigo, and drew comics. After graduating from Clarkston High School in 1991, he studied media arts, screenwriting, film production and film theory at Michigan State University. He graduated from Michigan State in 1995, and then moved to Los Angeles, California. In Los Angeles, Johns cold-called the office of director Richard Donner looking for an internship, and while Johns was being transferred to various people, Donner picked up the phone by accident, leading to a conversation and the internship. Johns started off copying scripts, and after about two months, was hired as a production assistant for Donner, whom Johns regards as his mentor. 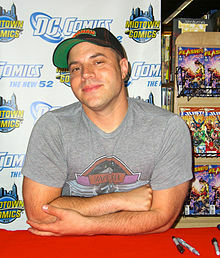 While working on production of Donner's 1997 film Conspiracy Theory, Johns visited New York City, where he met DC Comics personnel such as Eddie Berganza, reigniting his childhood interest in comics. Berganza invited Johns to tour the DC Comics offices, and offered Johns the opportunity to suggest ideas, which led to Johns pitching Stars and S.T.R.I.P.E., a series based on the second Star-Spangled Kid and her stepfather, to editor Chuck Kim a year later. Johns expected to write comics "on the side", until he met David Goyer and James Robinson, who were working on JSA. After looking at Stars and S.T.R.I.P.E., Robinson offered Johns co-writing duties on JSA in 2000, and Johns credits both him and Mike Carlin with shepherding him into the comics industry. That same year, Johns became the regular writer on The Flash ongoing series with issue 164. John's work on The Flash represents one example of his modeling of various elements in his stories after aspects of his birth town, explaining, "When I wrote The Flash, I turned Keystone City into Detroit, made it a car town. I make a lot of my characters from Detroit. I think self-made, blue-collar heroes represent Detroit. Wally West's Flash was like that. I took the inspiration of the city and the people there and used it in the books." John's Flash run concluded with #225. He co-wrote a Beast Boy limited series with Ben Raab in 2000 and crafted the "Return to Krypton" story arc in the Superman titles with Pasqual Ferry in 2002. After writing The Avengers vol. 3 #57–76 (Oct. 2002-Feb. 2004) and Avengers Icons: The Vision #1–4 (Oct. 2002-Jan. 2003) for Marvel Comics, Johns oversaw the re-launch of Hawkman and Teen Titans. Johns was responsible for the return of Hal Jordan in 2005 as the writer of the Green Lantern: Rebirth mini-series and subsequent Green Lantern ongoing title. Johns was the writer of the Infinite Crisis crossover limited series (Dec. 2005– June 2006), a sequel to 1985's Crisis on Infinite Earths. Following this, Johns was one of four writers, with Mark Waid, Grant Morrison, and Greg Rucka, on the 2006–2007 weekly series 52. In 2006, Johns and Kurt Busiek co-wrote the "Up, Up and Away!" story arc in Superman and Action Comics. He then reunited with Richard Donner on the "Last Son" storyline in Action Comics with Donner co-plotting the series with his former assistant. The Justice Society of America series by Johns and artist Dale Eaglesham began in February 2007 and six months later, he and Jeff Katz launched the new Booster Gold series. That same year, Johns helmed the critically acclaimed "Sinestro Corps War" storyline in the Green Lantern titles. He wrote the "Final Crisis" one-shot Rage of the Red Lanterns with artist Shane Davis and collaborated with Gary Frank on Action Comics. Johns and Frank produced the "Brainiac" storyline in which Superman's adopted father Jonathan Kent was killed and retold Superman's origin story in 2009's Superman: Secret Origin. Also in 2009, Johns teamed with artist Ethan Van Sciver on The Flash: Rebirth miniseries, which centered on the return of Barry Allen as the Flash and wrote the Blackest Night limited series. Commenting on Johns' creation of such concepts as the Blue Lantern Corps, the Red Lantern Corps, and the Indigo Tribe, DC Comics writer and executive Paul Levitz noted in 2010 that "One of Johns' sharpest additions to DC mythology is the notion that the Green Lanterns are but one color within a rainbow spectrum, and that the other hues have their own champions. Folding in old concepts and inventing new ones, Johns has established limitless story possibilities." On February 18, 2010, Johns was named the Chief Creative Officer of DC Entertainment, which was established to expand the DC Comics brand across other media platforms. Johns stated that the position would not affect his writing. He then co-wrote the Brightest Day series with Peter Tomasi. He and Marv Wolfman were the principal writers of DC Universe Online, a massively multiplayer online role-playing game released in 2011. In September 2011, following the conclusion of Johns' mini series, Flashpoint, and the crossover storyline of the same name, DC Comics instituted a program called The New 52, in which the publisher cancelled all of its superhero titles and relaunched 52 new series with #1 issues, wiping out most of the then-current continuity. Johns and artist Jim Lee, DC Comics' Co-Publisher, launched the line with a new Justice League series, written and illustrated by Johns and Lee, respectively. The series' first story arc was a new origin of the Justice League, which depicted the return of DC's primary superheroes to the team. Johns' contributions to The New 52 include a serialized Shazam! (Captain Marvel) backup feature in Justice League that began with issue #7, as well as the relaunched Aquaman and Green Lantern monthly titles. Johns and Gary Frank collaborated on the Batman: Earth One graphic novel, an out of continuity story, released in mid-2012, which served as the first in a series of graphic novels intended to redefine Batman. In 2013, after writing Green Lantern for nine years, Johns ended his run with issue 20 of the New 52 series, which was released May 22, 2013. DC Comics' All Access webcast announced on February 4, 2014 that Johns would be writing the Superman series which would be drawn by John Romita Jr. The Johns/Romita Jr. team was joined by inker Klaus Janson. In May 2016, Johns was promoted to President and Chief Creative Officer of DC Entertainment and reported to Diane Nelson, the President of DC Entertainment. As of 2017, Johns and Gary Frank are collaborating on Doomsday Clock, a limited series featuring Superman and Doctor Manhattan. Johns and Richard Donner co-wrote "The Car" chapter in Action Comics #1000 (June 2018) which was drawn by Olivier Coipel. In June 2018, Johns stepped down from his executive role at DC Entertainment and entered into a writer and producer deal with Warner Bros. and DC Entertainment. He opened Mad Ghost Productions, a production company that works on film, television and comic books based on DC Comics properties. Johns served as a co-producer and creative consultant for the 2011 Green Lantern film directed by Martin Campbell and starring Ryan Reynolds. Johns was an executive producer on the 2016 film Batman v Superman: Dawn of Justice. Following negative critical reception to the film, Johns and Jon Berg were named to jointly run the DC Extended Universe and a newly established Warner Bros. division, DC Films, in May 2016. They served as producers on the 2017 film Justice League. Johns also co-wrote the story for Aquaman with James Wan and Will Beall, co-wrote the story for Green Lantern Corps with David S. Goyer and co-wrote Wonder Woman 1984 with Patty Jenkins and David Callaham. In January 2018, after Justice League underperformed at the box office, Jon Berg was replaced by Walter Hamada as the head of DC Films, with Johns still working "closely" with Hamada on future productions. "Recruit", a 2005 episode of the Superman prequel series Smallville, on which Johns' studio mate Jeph Loeb was a writer-producer, featured a villain by the name of Geoff Johns. In 2008, Johns wrote "Legion", the eleventh episode of the eighth season, in which he introduced the three core members of the Legion of Super-Heroes. At the 2009 San Diego Comic-Con, he announced that he was writing another Smallville episode, titled "Society," based on the Justice Society of America. The success of his first episode and the ambitious nature of his follow-up episode enabled the producers to transform it into a two-part story, which subsequently aired as a feature-length episode titled "Absolute Justice". In 2006, Johns co-wrote the story for the Justice League Unlimited episode "Ancient History", which starred Hawkman, Hawkgirl, Vixen, Shadow Thief and the Green Lantern John Stewart. Johns and David S. Goyer co-wrote the pilot for the Spike TV drama Blade, which premiered in June 2006. Johns served as one of the writing staff on the television show. Later that year, Johns teamed up with Matthew Senreich of Robot Chicken fame to write the screenplay for a holiday family-friendly movie titled Naughty or Nice for Dimension Films. Johns and Senreich are billed as directors of the movie, with actor/producer Seth Green set to provide a lead voice as well as serving as voice director on the film. This association led to Johns contributing material to the fourth season of Robot Chicken. In 2012, Johns joined The CW's Green Arrow origin series Arrow, as a writer. He first contributed to the first-season episode "Muse of Fire," which served as the introduction of The Huntress, the teleplay for which he co-wrote with executive producer Marc Guggenheim from a story by co-creator Andrew Kreisberg. Later in the season, Johns wrote the sixteenth episode, "Dead to Rights". The episode was directed by frequent Johns' collaborator Glen Winter. On July 30, 2013, it was announced at the summer TCA tour that Johns and Arrow co-creators Kreisberg and Greg Berlanti would be introducing Barry Allen in the second season of the show, with the potential of a spin-off for the character with the 20th episode acting as a backdoor pilot. CW executives were so pleased with the handling of the character that they forewent the backdoor pilot, in favor of a full-fledged version. In May 2014, The Flash was picked up to series, to premiere later that year. Johns serves as co-developer and executive producer. He co-wrote, with Kai Yu Wu, the episodes "Going Rogue", which introduces the villain Leonard Snart/Captain Cold to the series, and "Revenge of the Rogues", which brought the rogue Heat Wave to the series fully after being introduced off screen in "Going Rogue". As of July 2015, Johns is collaborating with Reginald Hudlin and Denys Cowan on a live-action digital Static Shock series from DC and Warner Bros. Blue Ribbon division. In July 2018, Johns announced that he would be writing and executive-producing a DC Universe television series about Courtney Whitmore, a character he created, titled Stargirl, which would premiere in 2019. His younger sister, Courtney, was a victim of the TWA Flight 800 crash. The DC Comics character Courtney Whitmore, whom Johns created, is based on her. In a 2010 interview, Johns named Steve McNiven as an artist he would like to collaborate with, J. Michael Straczynski's run on Thor as his then-favorite ongoing comic book, and The Flash as his favorite of all time, stating that he owns every issue of it. He credits reading James Robinson's The Golden Age as the book responsible for his love of the characters featured in the book, and for his decision to accept writing duties on JSA. He is also a comic book retailer who co-owns Earth-2 Comics in Northridge, California, with Carr D'Angelo and Jud Meyers. ^ Cronin, Brian (August 5, 2010). "Comic Book Legends Revealed #272". Comic Book Resources. Retrieved February 7, 2019. ^ a b c d e f g h i "Geoff Johns Conquers the Universe". Comic-Con Magazine. Winter 2010. pp. 7–11, 19. Archived from the original on March 7, 2010. ^ a b c Reardon, Wendi (June 15, 2011). "Clarkston grad sees green". Clarkston News. Archived from the original on October 29, 2013. ^ Phillips, Jevon (January 15, 2009). "Geoff Johns brings the Legion to Smallville". Los Angeles Times. Archived from the original on February 21, 2014. ^ a b Henrickson, Eric (August 30, 2011). "Metro Detroit native Geoff Johns talks DCnU". The Detroit News. Archived from the original on April 17, 2014. ^ Bao, Robert (February 20, 2012). "Geoff Johns: The New 52". Michigan State University Alumni Association. Archived from the original on January 10, 2014. ^ Sands, Rich (January 12, 2009). "Future Tense". TV Guide: 39. ^ Manning "1990s" in Dolan, p. 288: "James Robinson left the title in the capable hands of [David] Goyer's new writing partner, Geoff Johns." ^ Cowsill, Alan "2000s" in Dolan, p. 294: "Beast Boy...found himself in deep trouble during his first miniseries, courtesy of writers Ben Raab and Geoff Johns, with art by Justiniano." ^ Cowsill "2000s" in Dolan, p. 306: "Scripted by Geoff Johns and illustrated by Pasqual Ferry, the story delivered an emotional punch as Superman and his father were reunited." ^ Cowsill "2000s" in Dolan, p. 310: ""None [of the Teen Titans series] had reached the heights of the Marv Wolfman and George Pérez era until writer Geoff Johns and artist Mike McKone's relaunch." ^ Cowsill "2000s" in Dolan, p. 315: "Writer Geoff Johns took one of DC's greatest heroes to the top of the bestseller list with Green Lantern: Rebirth." ^ Cowsill "2000s" in Dolan, p. 323: "A hugely successful, seven-part miniseries, Infinite Crisis was a sequel to 1985's Crisis on Infinite Earths. Written by Geoff Johns with art by Phil Jimenez, George Pérez, Jerry Ordway, Ivan Reis, and Andy Laning, Infinite Crisis was an epic crossover that revamped the DC Universe." ^ Cowsill "2000s" in Dolan, p. 325: "The title was masterminded by writers Geoff Johns, Grant Morrison, Greg Rucka, and Mark Waid, with Keith Giffen providing art breakdowns." ^ Cowsill "2000s" in Dolan, p. 329: "Writer Geoff Johns and artist Dale Eaglesham relaunched the JSA, with Alex Ross providing covers for the series." ^ "Sinestro Demands More Reprints". IGN. August 27, 2007. Archived from the original on April 19, 2014. Retrieved September 3, 2007. ^ Brownfield, Troy (September 17, 2007). "Best Shots: JLA Wedding Special, DD 100, New Avengers, and more". Newsarama. Archived from the original on October 15, 2007. ^ Rogers, Vaneta (December 20, 2007). "The Lantern's Artists, I – Ethan Van Sciver". Newsarama. Archived from the original on June 23, 2007. ^ Cronin, Brian (October 15, 2007). "Sinestro Corps War is what World War Hulk SHOULD be". Comic Book Resources. Archived from the original on February 22, 2014. ^ Renaud, Jeffrey (January 9, 2008). "Geoff Johns Thinking Big in the DCU, Part 1". Comic Book Resources. Archived from the original on February 22, 2014. ^ Cowsill "2000s" in Dolan, p. 330: "The series proved to be another successful epic in the Green Lantern saga, one of DC's most popular titles since Geoff Johns' revamp of the hero." ^ Rogers, Vaneta (October 27, 2008). "Geoff Johns on Final Crisis: Rage of the Red Lanterns". Newsarama. Archived from the original on February 24, 2014. ^ "Gary Frank Signs Exclusive With DC". Newsarama. May 10, 2007. Archived from the original on December 29, 2013. ^ Cowsill, Alan "2000s" in Dolan, p. 335: "In Action Comics story arc 'Brainiac', writer Geoff Johns and artist Gary Frank added another definitive chapter to one of the most iconic runs in the history of the comic." ^ Brady, Matt (November 28, 2008). "Geoff Johns: Telling Superman's Secret Origin". Newsarama. Archived from the original on June 9, 2013. ^ Cowsill "2000s" in Dolan, p. 337: "Writer Geoff Johns and artist Ethan Van Sciver...joined forces again to relaunch Barry Allen as the Flash." ^ Rogers, Vaneta (July 24, 2008). "SDCC '08 – Johns & Van Sciver Talk Flash: Rebirth". Newsarama. Archived from the original on February 3, 2014. ^ Cowsill "2000s" in Dolan, p. 339: "Flowing naturally out of writer Geoff Johns' legendary run on Green Lantern, the seeds of Blackest Night had been planted at the start of Green Lantern: Rebirth (December 2004) and it took an eight-issue series of its own to tell." ^ Levitz, Paul (2010). "The Modern Age 1998–2010". 75 Years of DC Comics The Art of Modern Mythmaking. Cologne, Germany: Taschen. p. 698. ISBN 9783836519816. ^ Cowsill "2000s" in Dolan, p. 340: "Publisher Paul Levitz stepped down, and co-publishers Dan DiDio and Jim Lee, along with DC Entertainment chief creative officer Geoff Johns, teamed up to helm DC Comics." ^ Hyde, David (February 18, 2010). "Jim Lee and Dan DiDio Named Co-Publishers DC Comics. Geoff Johns to Serve as Chief Creative Officer. John Rood Named EVP, Sales, Marketing and Business Development. Patrick Caldon Named EVP, Finance and Administration". DC Comics. Archived from the original on February 21, 2010. The new senior executive team includes Jim Lee and Dan DiDio, who have been named Co-Publishers of DC Comics, and Geoff Johns, who will serve as Chief Creative Officer of DC Entertainment. ^ Hyde, David (February 18, 2010). "A note from Geoff Johns". DC Comics. Archived from the original on February 20, 2010. ^ Cowsill "2000s" in Dolan, p. 341: "Co-written by Geoff Johns and Peter J. Tomasi, and illustrated by Ivan Reis, Patrick Gleason, Ardian Syaf, Scott Clark, and Joe Prado, Brightest Day was the start of the next chapter in the history of the DC Universe." ^ Thang, Jimmy (September 15, 2008). "DC Universe Online nabs writer Geoff Johns". IGN. Retrieved May 7, 2018. ^ "DC Universe Online". Gamesindustry.biz. January 11, 2011. Retrieved May 7, 2018. ^ Truitt, Brian (May 3, 2011). "DC Comics ready for a risky yet relevant publishing change". USA Today. Archived from the original on April 19, 2014. ^ Guerrero, Tony (January 26, 2012). "Interview: Geoff Johns Talks Justice League, Aquaman, Green Lantern & 'Shazam!'". Comic Vine. Archived from the original on April 19, 2014. ^ Kilpatrick, Conor (February 29, 2012). "Interview: Geoff Johns on Green Lantern, Aquaman, Justice League, & 'Shazam!'". iFanboy. Archived from the original on October 29, 2013. ^ Truitt, Brian (April 23, 2012). "Aquaman's sea world expands with introduction of the Others". USA Today. Archived from the original on April 19, 2014. ^ Segura, Alex (December 7, 2009). "DCU in 2010: Welcome to Earth One". DC Comics. Archived from the original on December 19, 2013. ^ "Bug continues the Earth One goodness with Batman: Earth One writer Geoff Johns!". Ain't it Cool News. December 7, 2009. Archived from the original on May 12, 2013. ^ Moore, Matt (February 11, 2013). "Geoff Johns stepping down as Green Lantern writer". Yahoo! News. Archived from the original on May 20, 2013. ^ Johnston, Rich (February 4, 2014). "Scoop: The New Look For John Romita Jr's Superman – And Confirmation That Geoff Johns Will Be Writing It". Bleeding Cool. Archived from the original on February 6, 2014. ^ McMillan, Graeme (February 4, 2014). "John Romita Jr. Signs with DC for Superman with Geoff Johns". The Hollywood Reporter. Archived from the original on February 6, 2014. ^ Khouri, Andy (February 4, 2014). "Geoff Johns Returns To Superman In Collaboration With John Romita Jr". ComicsAlliance. Archived from the original on February 6, 2014. ^ Johnston, Rich (July 26, 2016). "Scoop: Geoff Johns Is Now President As Well As Chief Creative Officer Of DC Entertainment". Bleeding Cool. Retrieved July 28, 2016. ^ McMillan, Graeme (July 27, 2016). "Geoff Johns Confirmed as DC Entertainment President". The Hollywood Reporter. Retrieved May 7, 2018. ^ Wickline, Dan (May 14, 2017). "Johns and Frank's Doomsday Clock Pits Superman vs. Dr. Manhattan in 4–Part Stand–Alone Series". Bleeding Cool. Archived from the original on May 17, 2017. ^ Schedeen, Jesse (May 14, 2017). "Geoff Johns Continues DC Rebirth Saga in Doomsday Clock". IGN. Archived from the original on June 19, 2017. Johns, artist Gary Frank and colorist Brad Anderson will chronicle the long-awaited meeting between Superman and Watchmen's Doctor Manhattan in a mini-series entitled Doomsday Clock. ^ Johnson, Jim (April 18, 2018). "Action Comics #1000 Shows Superman Still Looks Good at 80 Years Old". Newsarama. Archived from the original on August 20, 2018. Richard Donner joins Geoff Johns and Olivier Coipel in the inspiring 'The Car', finally explaining just what happened after the events shown on the iconic cover of Action Comics #1. ^ Kit, Borys (June 11, 2018). "Geoff Johns Exits DC Entertainment for Writing and Producing Deal (Exclusive)". The Hollywood Reporter. Retrieved June 11, 2018. ^ Cavna, Michael (June 16, 2011). "Riffing With Creators: Green Lantern writer-producer Geoff Johns waxes rhapsodic about Hollywood, Hal Jordan and his brightest days". The Washington Post. Archived from the original on April 17, 2014. ^ "Jesse Eisenberg and Jeremy Irons Join the Cast of Warner Bros. Pictures' Untitled Superman/Batman Film from Director Zack Snyder". Business Wire. January 31, 2014. Archived from the original on April 13, 2014. ^ "'Batman v. Superman' Fallout: Warner Bros. Shakes Up Executive Roles (Exclusive)". The Hollywood Reporter. Retrieved June 11, 2018. ^ Kit, Borys (May 17, 2016). "'Batman v. Superman' Fallout: Warner Bros. Shakes Up Executive Roles (Exclusive)". The Hollywood Reporter. Archived from the original on June 20, 2016. Retrieved May 19, 2016. ^ Keene, Allison (July 11, 2016). "Wonder Woman Screenwriters Confirmed by Warner Bros". Collider. Archived from the original on August 14, 2016. Retrieved July 27, 2016. ^ Kit, Borys (July 22, 2016). "Aquaman Movie Hooks Gangster Squad Writer (Exclusive)". The Hollywood Reporter. Archived from the original on August 11, 2016. Retrieved July 29, 2016. ^ Fleming, Jr, Mike (January 12, 2017). "Warner Bros Sets David Goyer, Justin Rhodes For 'Green Lantern Corps'". Deadline Hollywood. Retrieved May 7, 2018. ^ Lang, Brent (December 7, 2017). "DC Shake-Up After 'Justice League' Stumbles (Exclusive)". Variety. Retrieved May 7, 2018. ^ Lang, Brent (January 4, 2018). "Warner Bros. Taps Walter Hamada to Oversee DC Films Production (Exclusive)". Variety. Retrieved May 7, 2018. ^ Mitovich, Matt (November 20, 2008). "Smallville Casting Scoop: Doomsday Scenario Brings 'Legion' Heroes to Town". TV Guide. Archived from the original on July 29, 2013. Retrieved November 24, 2008. ^ Ching, Albert (July 26, 2009). "SDCC 09 – Smallville Live! Geoff Johns to Write JSA Ep". Newsarama. Archived from the original on February 24, 2014. ^ Brady, Matt (December 7, 2008). "Geoff Johns: Getting His Robot Chicken On". Newsarama. Archived from the original on June 26, 2013. Retrieved December 11, 2008. ^ Busch, Jenna (February 27, 2013). "Arrow: Geoff Johns and Glen Winter on What's Coming". Fan Voice. Archived from the original on September 11, 2014. Retrieved September 6, 2014. ^ Goldberg, Lesley (July 30, 2013). "Flash Series From Arrow Producers in the Works at CW". The Hollywood Reporter. Archived from the original on July 6, 2014. Retrieved September 6, 2014. ^ Andreeva, Nellie (November 18, 2013). "CW's The Flash To Do Stand-Alone Pilot Instead Of Arrow Backdoor Pilot Episode". Deadline Hollywood. Archived from the original on October 7, 2014. Retrieved September 6, 2014. ^ Andreeva, Nellie (May 8, 2014). "CW Picks Up The Flash, iZombie, Jane the Virgin & The Messengers To Series". Deadline Hollywood. Archived from the original on September 7, 2014. Retrieved September 6, 2014. ^ Weiland, Jonah (July 16, 2015). "CBR TV @ SDCC: Geoff Johns Talks "The Flash" TV, Making Justice League Count". Comic Book Resources. Archived from the original on January 26, 2016. ^ Patten, Dominic (July 19, 2018). "Geoff Johns To Write & Produce 'Stargirl' Series For DC Universe – Comic-Con". Deadline. Retrieved July 19, 2018. ^ Brownfield, Troy (May 8, 2009). "Best Shots: Legion, Wonderland, Literals and More". Newsarama. Archived from the original on April 17, 2014. ^ Meyers, Jud (June 6, 2009). "ReTales". Comic Book Resources. Archived from the original on April 8, 2014. ^ "13th Annual Wizard Fan Awards". Hahn Library Comic Book Awards Almanac. Archived from the original on September 2, 2013. Retrieved October 28, 2010. ^ "15th Annual Wizard Fan Awards". Hahn Library Comic Book Awards Almanac. Archived from the original on September 2, 2013. Retrieved October 28, 2010. ^ a b "The Project Fanboy Award Winners – 2009 Winners and 2008 Winners". Project Fanboy. 2009. Archived from the original on September 2, 2010. Retrieved October 28, 2010. ^ "Scream Awards 2009 Winners". Spike. 2009. Archived from the original on February 22, 2014. ^ "Scream Awards 2010 Winners". Spike. 2010. Archived from the original on November 1, 2010. 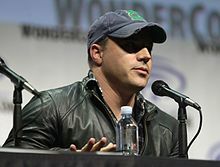 Wikimedia Commons has media related to Geoff Johns.